In modern times most people spend more and more time in the home environment, often working from home, so the causes of allergies are more likely to be found there. Double glazing, central heating, and fitted carpets are standard for most homes today, and have provided the ideal habitat for the dust mite. The usual skin tests performed are for mites, cats, dogs, other pets, and moulds in damp houses, because these are the most common allergens in the home. 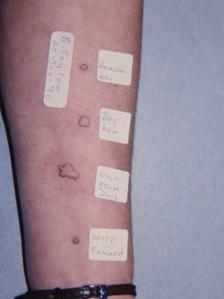 Although skin tests may indicate the most likely causes of an allergic problem, these testing extracts, which are produced in special laboratories to international standards, cannot relate precisely to the allergens in the home environment of the individual patient, so we all have our own personal environmental ‘ fingerprint’ which may differ considerably. House dust is obviously a complex mixture of known and unknown allergens containing vestiges of present and previous owners of the house, their pets, their pests, and their habits. It is now possible to analyse with great accuracy the amount of dust mite, cat, dog, and an increasing number of other allergens in the house dust of the patient, but these tests expensive and are mostly used as a research tool. Although this is a great scientific advance, the laboratory must be told which allergen to measure, and the significance of the results.to the patient has to be assessed clinically along with the other details of the case-history. Dust may contain an unexpected allergen such as the recent finding of large amounts of mouse allergen in dust from houses in New York occupied by asthmatic children. Mouse is not a routine test, and neither are tests for insects such as cockroach, which is very uncommon here because they require a warmer climate. Cockroaches are a common pest in the southern USA, and in some parts of Germany, where allergy to cockroach has been recognised as a significant problem. Other insects such as silverfish, ants, or fleas may colonise houses, and tests may not be obtainable. The Peak Flow Meter can be a very useful instrument for investigating the environment, and examples of significant Peak Flow charts are shown below. This is an extremely rare example from many years ago. The cause was proved beyond doubt by carrying out a bronchial provocation test with crude dust extract. It was suggested by a consultant that this boy’s asthma in the holidays was emotional in origin. The old family house was very dusty with many dogs, but granny had a new house with no pets where he stayed in the holidays. 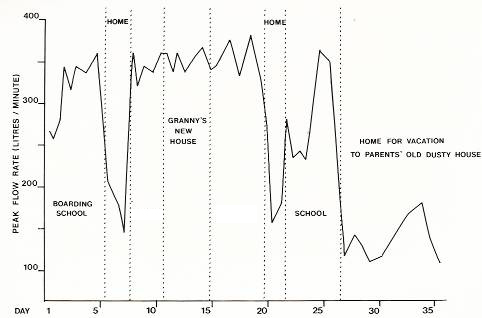 Note that a weekend at home before he went to school produced an abrupt drop in Peak-Flow. This boy was at a rather Spartan boarding school with no carpets, therefore fewer mites or animals. Chris was a severe asthmatic who had been thoroughly desensitised to dust mite, yet he continued to have serious attacks. On admission to the Derby Children’s Hospital for investigation he actually got worse, and his mother noticed that the hospital still had feather pillows, so she took him home. 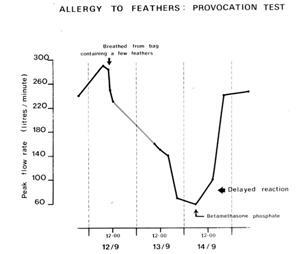 Although skin tests were negative for feathers, his mother, without being instructed to do so, carried out an improvised provocation test by having him inhale from a paper bag in which there were a few feathers, with such an obvious result that he had to have a short course of steroids, as shown above. She then showed that his peak flow would fall within minutes of sitting on a feather stuffed sofa, proving that feathers were also a significant allergy. 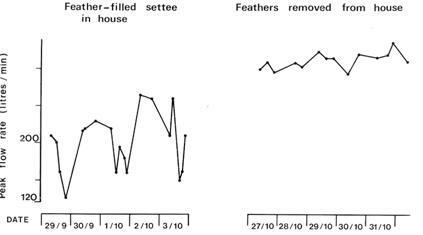 The peak flow chart shows how removal of all feathers from the house had a dramatic effect on his peak flow, he was soon a member of the Nottingham High School rugby team, and has been well since. I was somewhat taken aback by mother’s approach to this problem, which I would never have dared to suggest, but she got the answers! 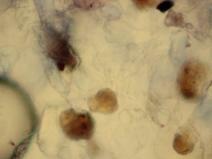 Allergy to feathers is not common, and can be associated with allergy to eggs or chicken. A patient was referred complaining of attacks of asthma every Sunday since he had had his flu vaccine injection, which is grown on chick embryo. The reason was that he normally had chicken for Sunday lunch, yet he had eggs for breakfast every morning without any effect, but with avoiding chicken he had no more asthma. At the present time it is considered that skin reactions to feather extracts are probably due to the fact that feathers are often infested with mites. 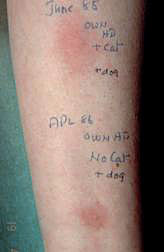 Skin reactions are very rare, and feather allergy is very uncommon, but it does exist occasionally. Wool used to be on everybody’s bed, and allergy to wool did occur, but have been substituted by duvets stuffed with down or a variety of synthetic materials which can become infested with mites. I once saw a young man who had asthma from November to April every year. He had a very positive skin reaction to cotton, with which his duvet was stuffed, and after he changed it he had no more asthma. I have never seen a similar case, but cotton stuffed bedcovers are still used by ethnic minorities. 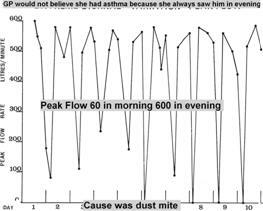 In this case the patient always saw her doctor in the evening, and he did not believe that she had asthma because her peak flow was always 600. When she was given her own meter it was found that in the early morning the peak flow was only 60. On further investigation the cause was found to be dust mite, and she was much improved with a new mattress and desensitisation. This was before the days of inhaled steroids. Crude extracts of house dust were used for skin testing and treatment for many years before the discovery that the dust mite was the major allergen. Many twenty years ago I saw a patient who complained that when he sat in his favourite armchair every evening looking at television he got uncontrollable sneezing fits, but at no other time or place. His skin tests were very positive for dust mites, so I asked him to bring samples of dust from his bed, his chair, and a general sample in separate vacuum cleaner bags. I mixed a little fine dust from his chair dust sample with a drop of water and pricking through it produced a very impressive reaction much larger than those produced in the same manner using the other dust samples as a skin test. He threw away the chair, which must have contained enormous numbers of mites, and his problem was solved. A nice neat easy solution!!! This amusing case suggested that this crude test could be developed into a useful method of investigating the environmental challenge. The droppings of the dust mite, the major source of mite allergens, are quite small, so dust samples have to be sieved to get rid of the fluff etc., so I improvised a dust shaker from an old electric razor attached to a very fine sieve from a Japanese tea stariner. 100 mgms of sieved dust was weighted out, placed in a 2ml disposable syringe with a disposable sterilising filter attached, and 1 ml of saline added. After a few minutes this mixture was pushed through the filter to remove any bacteria from the extract. A few drops of this crude extract are more than adequate for a skin prick test and, if positive, the reactions demonstrate to both patient and doctor the importance of their home environment. This is how my environmental dust test for individual patients was developed, and ever since has provided invaluable information on the relationship between patients and their home environment. 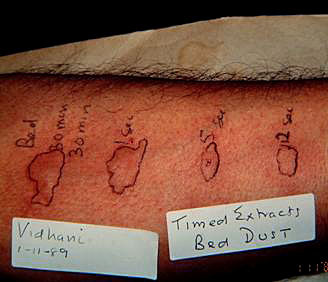 The skin reactions produced are often impressive, as in the case shown above right where an extract of the patient’s house dust produced a reaction as big as a very special laboratory extract made from a pure mite culture to an international standard of potency. Using a similar technique the hairs of any pet animal can be used to produce an immediate testing extract. The reactions produced can be bigger than the reactions produced by the standardised commercially produced testing extracts, and as some breeds of dogs are more allergenic than others using the hair of the family pet makes sense. A reaction can also be produced by rubbing pet hair into the skin. These procedures can strongly reinforce advice to find the pet a good home by showing the effects on the patient’s own skin. The environmental dust test can be repeated after using an acaricide, or following the departure of the pet and a spring cleaning, to show if the amount of allergen in the dust has decreased.. This method is much cheaper and quicker than the scientific method, as the dust sample does not have to be sent off to a distant laboratory, and the results are available in a few minutes. 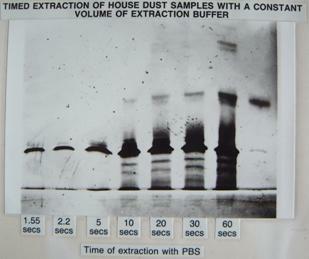 The photo on the left is a good example, as the biggest reaction is to home dust extract. This patient had had two years severe asthma, worse at home where there was a dog and a hamster to which skin tests were only slightly positive, but negative to mites, suggesting another cause. The patient was using a carpet shampoo cleaner twice a week, as she was mad about cleaning, When the cleaner was stopped the asthma ceased, except on one occasion when she arrived home shortly after her husband had used the carpet shampoo and had a severe attack. I had actually considered the hamster to be most likely answer as, in another case, asthma every night was caused by the dander from the hamster in the warm kitchen below floating up to the bedroom above. 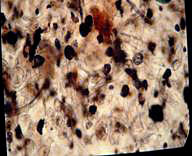 The removal of the hamster was curative, but the diagnosis was suggested by the case history, as usual. The intensity of skin reactions to extracts of environmental dusts vary greatly, sometimes being more intense than reactions to very expensive testing extracts made from mite cultures in laboratories under strictly controlled conditions. A negative mite test and a positive reaction to the patient’s own dust extract clearly suggests that an allergen other than mites is present in the dust and is the cause of the problem. On the left the reaction at the top is to the dust extract when the cat was still present in the house, and the lower one from the dust a year later when most of the cat allergen had gone and the patient no longer had a problem. 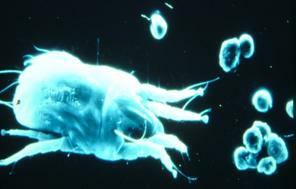 There was no reaction to dust mite. 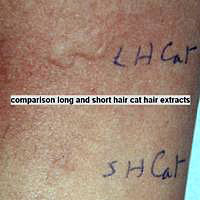 On right extracts from long and short haired cats are compared showing that the long haired cat is much more allergenic. Any dust allergic will tell you that a trace of dust will trigger sneezing in a very short time, just as grass pollen does. This fact suggests that the allergen from dust or pollen is dissolved out very quickly when pollen grains or particles of mite excreta are inhaled and settle on the moist surface of the eye, the nose, or the bronchial tubes. Many years ago I attempted to measure how quickly the allergen is released from pollen on wetting by plunging one of my special needles holding a drop of saline on the point into a tiny heap of pollen on the forearm of a pollen sensitive volunteer, then wiping it all off with a big pad of wet toilet tissues as quickly as possible, while timing this with a stopwatch. Even when wiped off in just under one second the skin reaction to the pollen was very large indeed, so I wondered if the allergen in dust would be released as quickly as the pollen. The set-up illustrated above consisted of a 1ml plastic syringe and needle containing saline to extract the dust. 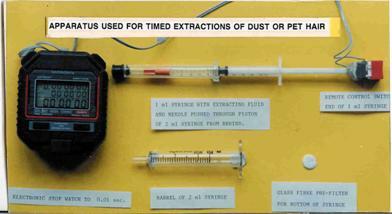 There was a contact on the end to switch on the stopwatch when the saline was injected through the rubber piston of the 2ml syringe which contained a measured amount of fine house dust, and neatly accommodated the 1 ml syringe. Thus the saline was injected into the dust, extracted, and after 2, 5, and 10.seconds, and 30 minutes, as shown, was pushed through the filter on the end of the 2ml syringe. The stopwatch would stop when pressure was released, thus giving the time of extraction. These experiments led to an interest in closer examination of house dust, the living environment of the mites, which very rarely seen in dust because they shy away from light. 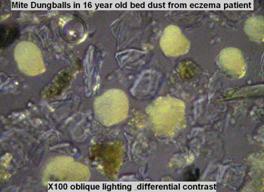 Bed dust is mainly composed of skin scales which provide a rich food source for the mites. It is said, but I cannot find the authority or imagine how the figure was arrived at, that we each shed at least 750 Gms of skin a year. Eczema sufferers must shed much more skin to feed the mites which produce droppings containing the powerful allergen which is often the cause of their eczema, thus forming a very vicious circle. These skin scales can also be seen in a sunbeam or the ray of light from a projector and are always present in the air in any inhabited building. 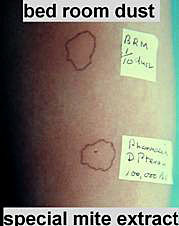 They provide a means of transmission of infection, as demonstrated by this picture of a skin scale stained to show the bacteria it is carrying. Under the microscope house dust contains grit carried into the house on shoes, fibres of all sorts from carpets and other furnishings, human and pet hairs, and skin scales. 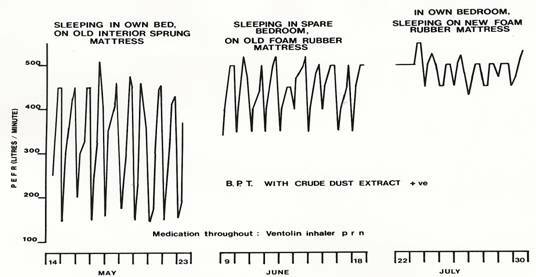 The most significant sample is from the bed, the bedding, the mattress, and the floor around the bed, because this is the dust that has the closest contact with the patient, who spends a large part of his or her life in this personal environment. General dust is obviously less important, but if symptoms are worse on a certain sofa or chair then separate samples can be most helpful. The major allergens of the dust mite are concentrated in the faecal particles, especially in the membrane which covers them like a little bag. 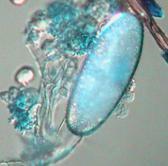 The mites are rarely seen, but the faecal particles can be distinguished with difficulty by using a cotton blue stain, and making sure that the layer of dust on the slide is as thin as possible. These particles are a little bigger than a pollen grain, so that when they become airborne they settle fairly quickly, unlike cat dander which is so small and light that it can remain in the air for days. 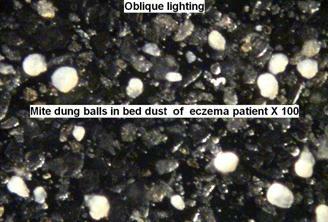 The faecal particles are still difficult to distinguish from dirt while the microscope light is coming from below, but by illuminating the specimen with light from the side, supplied by an adjustable fibre-optic light, they are easily seen and are quite distinct from the dirt particles and skin scales which are the main constituents. On the left the dust is illuminated from below, and the faecal particles are difficult to distinguish from dirt. This dust specimen (right) is from the bed of an eczema patient in 1988 which had been stored in a tube at room temperature and examined again in 2004. It is evident that the mite faecal particles are still there in abundance 23 years later. The remarkable improvement in his eczema after getting rid of the mites by using an acaricide is shown in the Acarosan section.